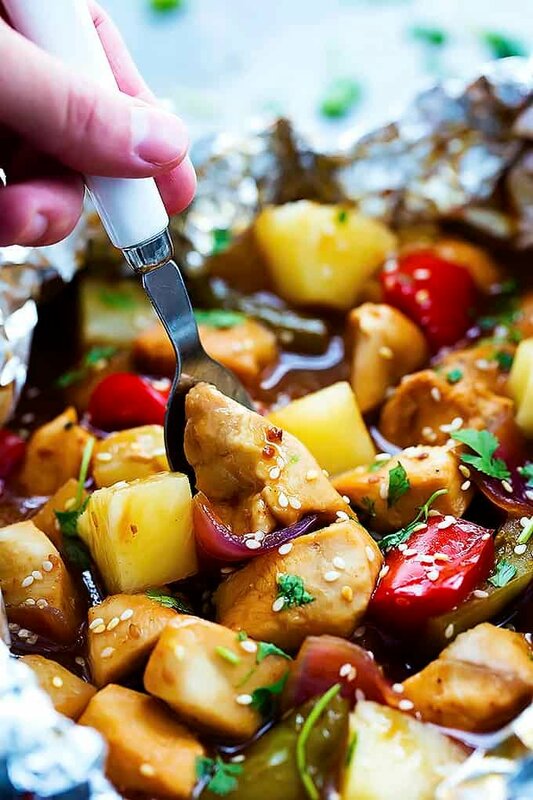 Grilled Pineapple Chicken Foil Packets – chicken, pineapple, peppers, and onions slathered in a sweet and savory teriyaki sauce and cooked on the grill! One of my favorite traditions growing up was tin foil dinners. That’s what we called them anyway. My mom always made them the same way: handmade hamburger patties + quartered baby potatoes + baby carrots. We’d cook them on the grill or over an open fire and when they were done, smother the heck out of them with ketchup. pineapple + chicken + red peppers + green peppers + onion + the BEST and EASIEST two ingredient sauce everrrrr x10. This recipe just might be my new favorite summertime dinner – try it, you’ll fall in love with it too! 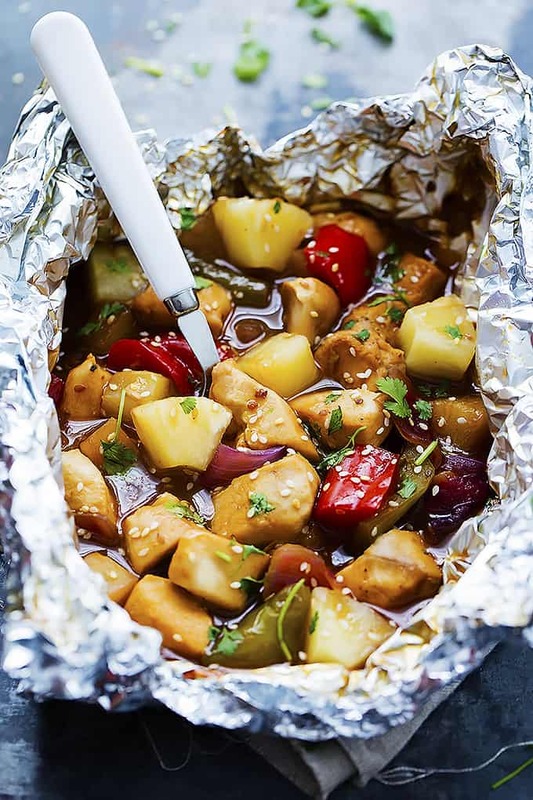 Grilled Pineapple Chicken Foil Packets - chicken, pineapple, peppers, and onions slathered in a sweet and savory teriyaki sauce and cooked on the grill! Preheat the grill. Lay out 4 large (about 24 inches long) pieces of foi. 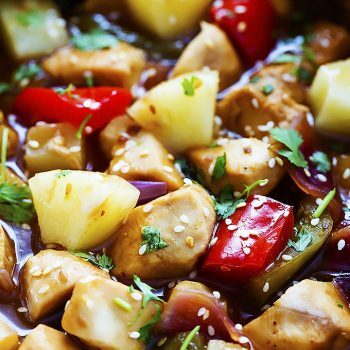 In a bowl whisk together teriyaki sauce and sesame dressing. Grill packets for about 10-15 minutes, turning over once half way through. Carefully unfold foil packets and check chicken to make sure it is cooked through. 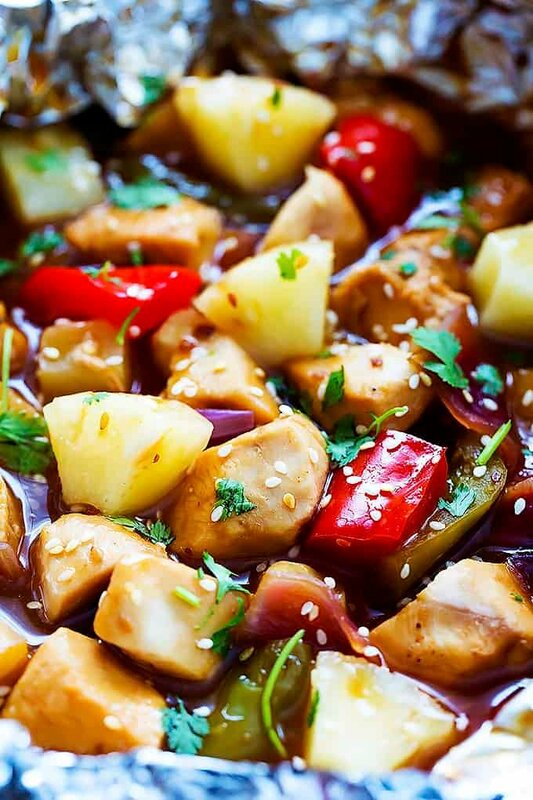 Garnish with cilantro and sesame seeds if desired, serve immediately. Yummy! This sounds really good!! Thanks Shawnna! We really loved how easy and tasty this meal was!! Mmm! Im definitely going to make these this week for my family! Could you cook these in the oven instead of grilling them? What temperature would you use on the grill?